Which New Features of the New Xerox Iridesse Production Printer Do I Need to Know About? Xerox is a well-known leader in the world of production print. 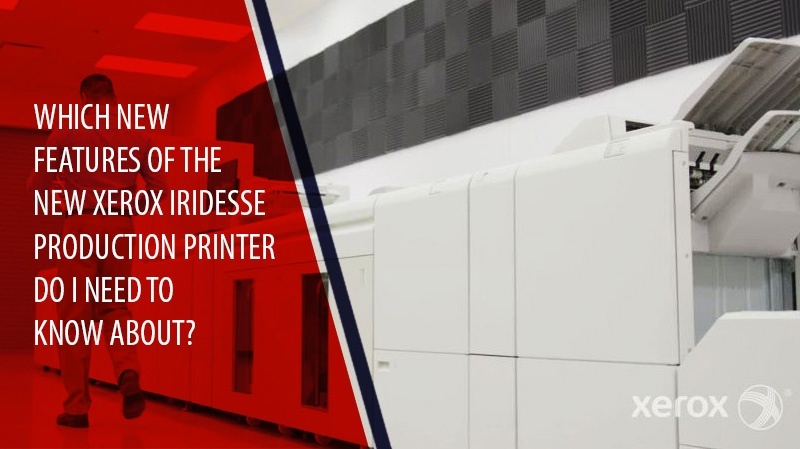 So how does the company's latest printer, the Iridesse, compare to its longstanding top-shelf products like the iGen and Versant-series printing presses? It turns out there are quite a few features that serve to make the Iridesse stand out. Perhaps the most important is the feature that gives the device its name: single-pass iridescent printing. The Iridesse combines Xerox's bright and vivid four-color CMYK printing capabilities with space for two additional dry inks on a single pass. This means that its users can enjoy full-color printing and iridescent gold and silver printing in a single pass. A recent study showed that print buyers are willing to pay a premium of 24% to 89% for specialized printing over CMYK only. Also, digital print enhancement volume is expected to reach 25 billion pages by 2020 – that’s over twice as many CMYK pages. The Iridesse represents a clear advantage to providers who need to fit print needs into demanding schedules. The ability to perform iridescent printing with two specialty dry inks in a single pass is unprecedented in the imaging industry, and represents a key value to any print provider who regularly prints with iridescent metallic inks. According to Keypoint Intelligence, the Iridesse's one-pass capability can generate profit margins on iridescent print orders of between 50% and 400%. But this just scratches the surface of the technology that Xerox incorporated in this powerful device. Xerox has put its best minds to work creating the Iridesse production press. Cutting edge technology lines the interior of the device, promoting better quality and smoother workflows than ever before possible. The software powering the Xerox Iridesse press is based on the Xerox EX-P 6 Print Server, which allows users to generate customized workflows and automate key processes throughout the print cycle. Automatic color calibration and advanced color management is part and parcel to the Iridesse's main value. Xerox FreeFlow Core features pre-built workflows, allowing the Iridesse to automatically select document elements when printing silver and gold without changing the source document. This simplifies the process of using specialty dry inks by removing the need to develop different versions of digital printed materials destined for different printers. High Definition Emulsion Aggregate Toner. The Iridesse uses this specialty toner to achieve lower gloss, smoother tinting, and finer detail with greater consistency than any other production printer in this price range. Dual High Capacity Feeders. Advanced feeders feature bypass and inserter options so that print providers can run up to 8 individual paper stocks in a single task, or perform production runs of up to 12,500 sheets. Comprehensive Finishing Options. The Xerox Crease and Two-Sided Trimmer are just some of the finishing modules you can add to your Iridesse production press. It is also compatible with the Xerox SquareFold Trimmer as well as with the Xerox Production Ready Booklet Maker Finisher. Simples and Duplex Print Capability. All of the production print capabilities that the Xerox Iridesse offers are available in both one-sided and dual-sided options. This increases the machine's capability to handle complex one-pass print runs. EZ Swap User-Configurable Color Sets. Unlike many other printers of its type, users can swap out and change the order of color sets without relying on a service technician. This lets users decide which special dry ink will underlay and overlay the traditional CMYK color matrix. Xerox Iridesse features such as EZ Swap color set capability allows print providers to accept jobs they would previously be unable to deliver consistent results on. EZ Swap enables print providers to choose the order in which colors are laid down. The ability for operators to decide the order that the printer lays down dry ink means greater consistency and happier customers across the board. This puts the Iridesse in a unique place among production printing presses. It is more than a powerful printer – it is a production printing platform that can change the standards by which the imaging industry measures versatility in production printing. Extended capabilities and operator-configurability set the stage for even greater innovation focused on the Iridesse. There is no reason Iridesse customers need to be limited by metallic gold and silver dry inks, for instance, since the color set is user-configurable. At Zeno, we know that print providers often have to face difficult challenges on their customers' behalf, and rely on their equipment to get jobs done with reliability and consistency. The Xerox Iridesse is a step in the right direction, offering a more powerful and streamlined production print solution than any other device in its class. Learn more about the Xerox Iridesse Production Printer. Our team is ready to help you choose the production press you need.